14-6 in some of the most embarassing gameplay I have ever had the displeasure of playing in. Thank goodness I drained my club to get PIM Socrates. He is incredible in behind FB Ibra even in awful gameplay. 20 goals and 16 assists in his 1st 20 games. Good luck to the rest of you guys this weekend. @jocksaltire_67 Thx! Socartes is the goat! Well great player but that attitude 🤣 Always the first person to complaint to the ref! Doubt ill ever pull one myself 😅 might give it one last shot tonight. 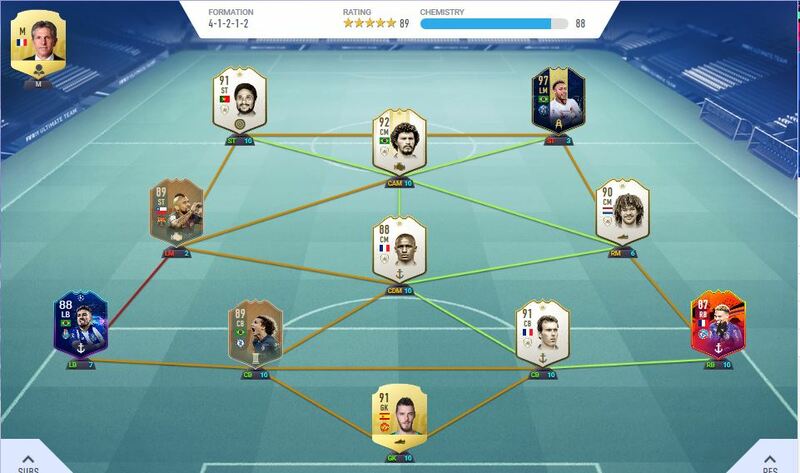 How is your Cr7 team looking now a days mate? @FrankFrank The CR7 team is always changing mate I've been playing with some themed teams recently so he's been sitting in the club collecting dust. Madness @Addicksfan 😮 that striker partnership is probably the one id go for if I could pick whoever I wanted! Would really like that Gervinho card but finding it tough to motivate myself to play again... @Addicksfan are singles really as dreadful as they sound atm? Was bad enough getting Talisca towards the end when everyone cottoned on to all the quit glitches and stuff. It’s absolutely horrendous atm. If you go one down it’s game over. So many scrappy lucky goals and people subbing on high end cards and the ball just dropping to them. On my best ever skill rating @1833 Is worth getting in Div3? Sort the stupid OP short freekick at the edge of the box out!!! 5 home games, 37 away games though. The MLS one was by far the most enjoyable, Zlatan, Almiron and Alessandrini are pretty decent, had no issues with Zlatan’s pace at all. Really did no click with the Ligue team, these type of players dont suit me at all, cruised through the Serie by subbing on CR7, no point wasting time against all the glitchers. Naldo and Gervinho done. Probably do Zlatan for SBC fodder. Probably won’t play again for a week now - considering I reached 14 wins with 9 to spare with a 25k side this weekend kinda kills off the small amount of motivation I had left to grind really. Just seems no point to it. Yes if the opponent isn't a docuhe which is rare, the delay and awful connection will get you instead!! Have you tried Naldo? I used him for 1 game and it was enough for me to know that he feels awful. His agility and balance is the worst I have ever used since I used Traore on fifa 14 he feels like he is playing with stilts on , this means he can't turn and gets done buy all agile players and he can't carry the ball forward. 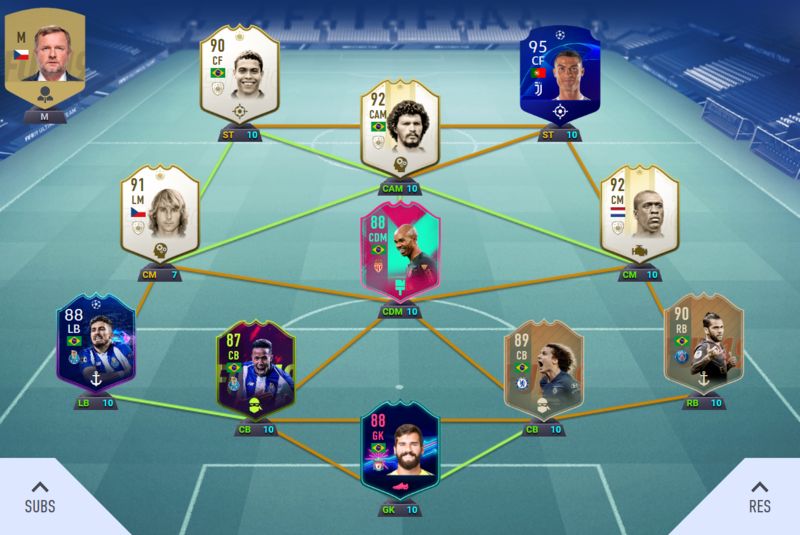 I've barely even played WL and I absolutely hate the gameplay. I've quit games I'm winning simply because of the nonsensical BS bounces and crap. I don't even want to see out the game because I'll likely end up losing it and be even more annoyed. I'm not going to try and hold the ball for 30 minutes to preserve a win when it's boring and not fun. I swear this game is like playing pool/billiards on a table that's heavily tilted to one corner, but you're not allowed to shoot at it and your opponent is. Now you have to deal with the fact that your opponents hole is like a magnet and you have to counter your normal game to accommodate the tilt. . .( I don't think this is that thing we can't talk about but rather the impossibility of dealing with net connectivity and a poorly coded physics engine). It's really a shame. I'm falling further and further from FIFA every time I play a game. Compound that with the constant mistakes in SBC released, horrible pack weight, and the fact that it seems they are done patching the game. . .it's just a joke. @Daveofwales01 "If Gullit is part of the question he is the answer"
Just looked it up and div 3 and 2 rewards seem worse than div4?!? How is gameplay in div3? For me div4 was more "fun" to play then div5 for some reason. Hardly play it but i am cruising through tbh..
One of the few wise words i have seen on this forum! Div 3 is like getting tortured by your TV screen, stick to Div 4 div 3 is either drop back merchants with god squads or people who have cheap squads but are insanely sweaty and shush, dab and send abuse. I am around 1820 in Rivals highest I have been is 1950 and Div 3 is just pure bull **** and unenjoyable for worse rewards relative to time put in as well. Thanks, this is exactly what i thought...Strange game in this aspect as well, I want to push myself to get better but then not getting rewarded for it....Div4 is actually pretty good, do you have the same experience? My team atm: - "How to make the meta even more meta"